Kent's final volume of James Carr spans nearly 25 years of sessions and compiles all his remaining studio recordings. The 24 track CD includes never before reissued (and issued!) sides from James' original mid-'60s Goldwax sessions plus both sides of his lone Atlantic and River City 45s from the 1970s (and an unissued "bonus demo" from the River City sessions). 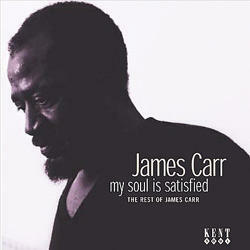 It also features all the tracks from James' "comeback" years with Soultrax Records that have never been on an Ace or Kent CD before (again including a previously unheard demo, "Woman's Got The Power," from James' final recording session) and the three gospel tracks he cut in the 1990s as featured guest vocalist with the Jubilee Hummingbirds.